Following our round-up of 2017’s classic and supercar events in the UK, here as promised is our pick of the best similar happenings abroad. Most are within a day or two’s drive of Calais, one is on the other side of the world and all are important fixtures on the international automotive social calendar. Note that a couple aren’t taking place until next year, but they’re all definitely worth the trip. Here’s to a terrific summer! Italy’s famous 1,000-mile road race was held most years from 1927 to 1957 when a halt was called to the madness following two fatal accidents causing the death of three participants and nine spectators. 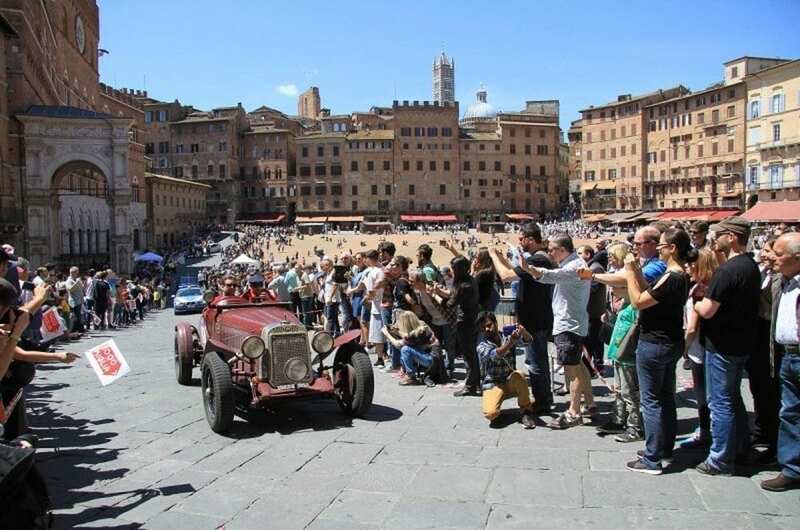 The retrospective Mille Miglia Storica was first run in 1977 and it subsequently became an increasingly popular annual happening from 1986 onward. Eligible cars are essentially those which competed in the original Mille Miglias – anything from a 1920s ‘Blower’ Bentley to a tiny 1930s Fiat Topolino to a 1950s Ferrari 250 TdF – but the Storica is always over-subscribed so unless you happen to own an ex Nuvolari Alfa or an ex Caracciola Mercedes, gaining an entry can be almost as much of a challenge as the gruelling, sleep-depriving driving. However, the 4-leg route winds from Brescia to Padova to Rome to Parma and back to Brescia, taking in many of Italy’s most beautiful towns and most scenic countryside, so there’s fun to be had by leap-frogging the competitors, stopping somewhere pleasant en route and watching the show roll through. Whichever way you do it will take some forethought and planning, and by the time you read this the 2017 event will already be underway. But no matter, there’s always next year. First held in 1929 at the Grand Hotel Villa d’Este on the shores of Lake Como, this highly prestigious concours event ran off-and-on up until 1951. There was then a gap of some 44-years until the event was revived at the same location in 1995. Featuring a broad mix of cars and motorcycles from the 1920s to the present day, the accent at Villa d’Este is on aesthetics, style and seminal design rather than the fastidious correctness of every nut and washer. Concours entry is by invitation from those already registered, and the themes and categories change on an annual basis. Every other year (2017 included) RM Sotheby’s holds an auction of up to 70 classics. The lots can be inspected on the Friday at the nearby Villa Erba with the sale held there the following evening. Villa Erba is also the setting for a motorcycle concours on the Saturday, while Saturday at Villa d’Este is a private affair for concours entrants, judges and VIPs. All the vehicles are then displayed at Villa Erba on the Sunday where the public votes for the Best of Show and the awards are presented. It may be a 10-hour flight to San Francisco but for the car buff there’s much to see and do every August at nearby Monterey and the surrounding area. This year the activities start with a classic car show at Old Monterey on Friday 11th. This is followed by the Monterey Automobilia Expo, the Pacific Grove Kickoff Cruise-In gathering, Carmel’s Concours on the Avenue, Pacific Grove’s Little Car Show and the finish of the Pebble Beach Motoring Classic road trip. Over the same period there are classic car auctions staged by RM Sotheby’s, Russo & Steele, Mecum, Rick Cole and Gooding & Co., and then there’s the Rolex Motorsports Reunion at Laguna Seca, the Rolex Pebble Beach Tour d’Elegance, the Pebble Beach Retroauto, the Pebble Beach Classic Car Forum, the Pacific Grove Rotary Concours Auto Rally, the Legends of the Autobahn (featuring Audis BMWs and Mercs), the Werks Reunion (Porsches), the Quail Motorsports Gathering, Exotics on Cannery Row, the Concorso Italiano, the Concours d’Lemons and the Automotive Fine Arts Society Exhibition. 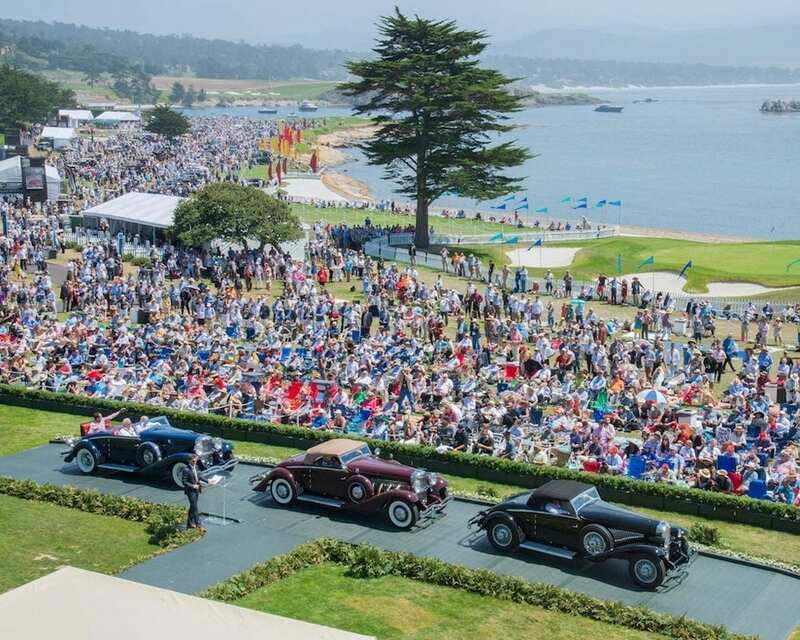 The week then culminates on Sunday 20th with the Pebble Beach Concours d’Elegance. First held in 1950 this world famous fixture has been held on the fairway of the 18th hole of the Pebble Beach Golf Links every year bar one since 1952. In recognition of Ferrari’s 70th anniversary, this year will see unique gatherings of the Maranello maker’s major race winners and one-off specials. With the inaugural event held as recently as 2013, the Chantilly Arts & Elegance is a relative newcomer to the top-flight automotive social season. Situated about an hour’s drive northeast of Paris, among the many attractions is a Concours d’Elegance with a difference as it combines up to 20 concept cars from many of the premium manufacturers with haute couture from the premier fashion houses. The Concours d’Etat is a more conventional gathering of around 100 of the world’s most beautiful cars, and among the 15 or so categories are four devoted to Ferraris that raced in the Le Mans 24hrs from 1948 to 1974. On the day before the judging the cars entered will have driven a 100km road route through the local forests, punctuated by lunch in a splendid restaurant. 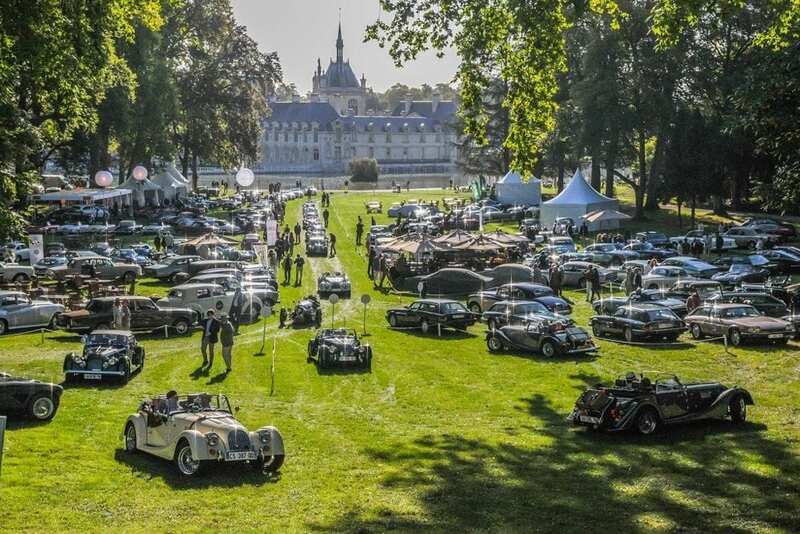 The Grand Prix des Clubs is a competition whereby around 40 owners’ clubs compete with one another on the basis of the quality, diversity and originality of the 800 or so cars present, as well as the presentation of their ‘Déjeuner sur l‘Herbe’, or picnics! Staged for the first time last year and being repeated this year, the 2016 Chantilly Supercars Rally attracted around 30 entrants which made their way to the private, banked Mortefontaine southeast of Chantilly where they could be driven at speed. Among the cars last year were Alfa 8Cs, DB7 Zagatos, i8s, EB110s and Veyrons, a Ferrari Enzo, FF, F40, F50 and a 288 GTO, Ford GTs, Gumpert Apollos, Diablos and Gallardos, P1 GTRs, Mercedes SLRs, Zondas, Carrera GTs and 918s. 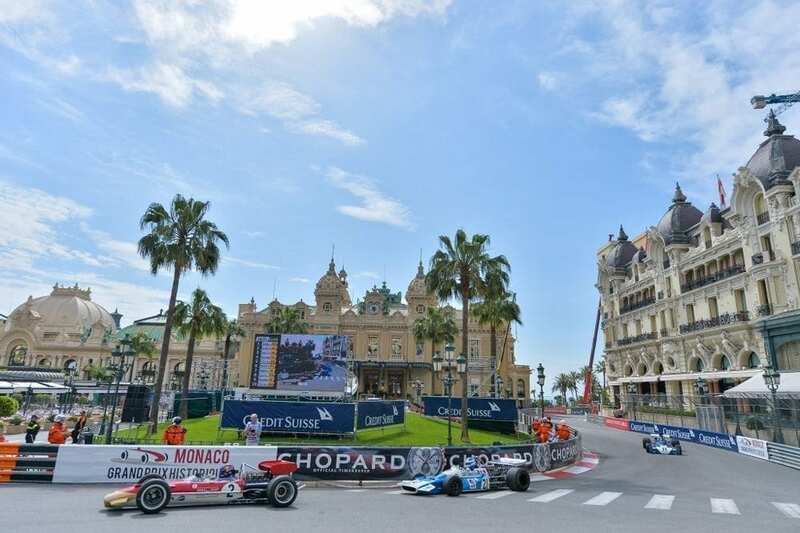 This is a biennial fixture so please note that the next one isn’t until May next year, which gives you time to plan and prepare even if you’re not competing in what’s essentially a race meeting for pre 1980 racing cars on Monaco’s famed GP circuit. The 2018 event will be the 11th Monaco Historic GP and, in addition to the practice and qualifying sessions, it will feature seven races, most with three classes within each race. These will include Formula 1 cars from a number of different eras as well as the no less glamorous Aston Martin, Jaguar, Ferrari and Maserati sportscar racers of the 1950s. Unlike the Monaco GP or any other F1 World Championship round, at the Monaco Historic GP the public can mingle with the cars and drivers in the paddock, and the whole event has a much more relaxed and, dare we say, enjoyable atmosphere. Too busy or otherwise unable to take in any of the automotive festivities abroad? Well worry not as here are two more UK events that are well worth attending. We’re passionate about fine cars at JBR Capital and we can quickly build a bespoke finance package to suit your needs. So if you’re interested in acquiring the classic car of your dreams then please call one of our experts today on 020 3355 0035 to explore your finance options.